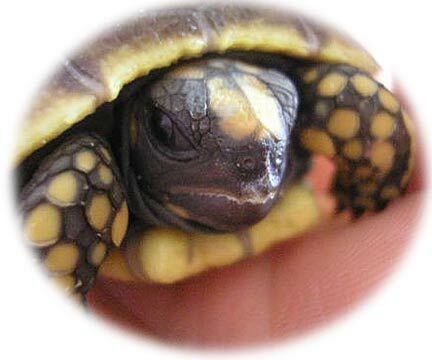 Yellow-foot tortoises are tropical rain forest tortoises whose range covers most of tropical South America. There are several regional variants, with some large adults having a straight carapace length (SCL) of up to 16”-17” (these larger Yellow-Foots usually inhabit the tropical forests of southern Brazil, in the Pantanal range). There are possibly several sub-varieties of Yellow-Foots that will one day be separated into sub-species, and the most commonly recognised of these is the cherry-headed Yellow-Foot, or dwarf Yellow-Foot, whose SCL rarely exceeds 12” (10” being the average). We are currently reviewing the Yellow-foot care sheet. The Yellow-foot is a large non-hibernating species, that requires a large heated area throughout the winter and poor summer months. Originating from the rainforest region the Yellow-foot requires a humidity of around 80%, which is very costly and difficult to achieve for most. This is a tortoise for the serious keeper where ongoing expense is no object.